My wife and I brought the kids to see Lego Movie over the weekend. I saw a few trailers for it, and didn’t think it looked all that great, but heard great things about it. We went to a 3D showing. “Everything was awesome!” The only thing I don’t recommend about it is seeing it in theaters because at $11.00 per person, I might as well have waited until it came out, and I could have bought the Blu-Ray and pizza for the same price we paid. Lego Movie was almost entirely constructed out of real Lego’s. To me, that is the most amazing part of it. The creativity that Lego Movie has inspired in myself and my kids is invaluable. The movie stressed on team work and also embracing your own abilities; believing in yourself and accomplishing wonders. You can go to any number of other websites and get the full synopsis… There were many A-list actors who voiced characters in Lego Movie. Will Ferrell not only voiced the villain, but was one of two human characters in this animated, soon to be classic movie. 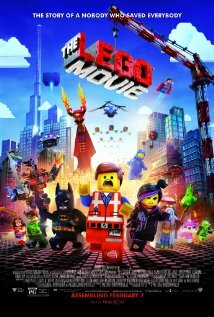 One thing I appreciated about Lego Movie was that the creators didn’t resort to adult-themed humor to keep the parents engaged. There was a well-developed plot and the story kept even my three-year-old entertained throughout. After the movie was over, my kids sang variations of “Everything is awesome”, which is the main musical theme throughout the movie. They sang Trinity is awesome, Noah is awesome, and Chloe is awesome! This movie brought my kids together for an entire ride home, which is AWESOME! Handy Father would most definitely recommend that you bring your kids out to see, or wait and buy Lego Movie! You will not be disappointed, and neither will your kids. …now I’m off to my mom’s to see if I can find my old box of Lego’s.